We’d love your help. Let us know what’s wrong with this preview of Parts by Tedd Arnold. The young narrator has discovered a disturbing trend: There's fuzz in his belly button his toes are peeling and something just fell out of his nose. The last straw is a loose tooth, which convinces him of the awful truth his parts are coming unglued!Parts deals with a subject of deepest interest to every young child: the stuff our bodies shed. To ask other readers questions about Parts, please sign up. CAn I read this book or not? Sarah NO I CAN'T. I can't read this book so would someone please fix this? A young boy becomes seriously alarmed when he notices that certain bodily functions - hair coming out on his comb, lint forming in his navel, a tooth loosening - seem to indicate that he is coming unglued. Is his body coming apart - disintegrating into its constituent parts? Or have his parents simply neglected to tell him some of the facts of life...? Young children will enjoy being "in the know" as they listen to this entertaining picture-book from author/illustrator Tedd Arnold. With a rhyming A young boy becomes seriously alarmed when he notices that certain bodily functions - hair coming out on his comb, lint forming in his navel, a tooth loosening - seem to indicate that he is coming unglued. Is his body coming apart - disintegrating into its constituent parts? Or have his parents simply neglected to tell him some of the facts of life...? Well, that was adorable! I'm not sure how many 5-year-olds are just that literal (none of mine were at that age), but it makes for a cute, and funny story. A perk of substituting for a 2nd-grade class. 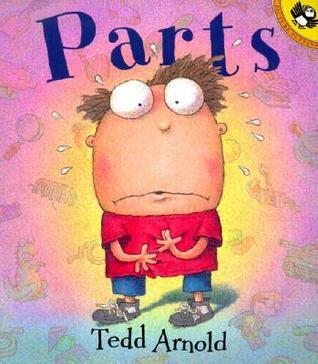 “Parts” is a wonderful book about body exploration from the mind of the creator of “Green Wilma,” Tedd Arnold. This book is about how a young boy starts to panic when weird things start to happen to his body. This book was voted Best Children’s Book for Parents Magazine and it richly deserves that honor as it is surely a children’s classic. Tedd Arnold has done a great job in writing the boy’s woes in a rhyming text, which makes this story even more humorous and reassuring. Tedd Arnold creativel “Parts” is a wonderful book about body exploration from the mind of the creator of “Green Wilma,” Tedd Arnold. This book is about how a young boy starts to panic when weird things start to happen to his body. This book was voted Best Children’s Book for Parents Magazine and it richly deserves that honor as it is surely a children’s classic. Tedd Arnold has done a great job in writing the boy’s woes in a rhyming text, which makes this story even more humorous and reassuring. Tedd Arnold creatively extends on how children feel like the world is coming to an end when strange stuff start happening to their body and this boy (remember he is only five years old) and how parents usually makes things better by explaining the situation to their child in a calm manner, such as the boy’s parents explaining to the boy that everything happening to him is perfectly normal. Also, Tedd Arnold’s illustrations are humorous since he portrays the boy as a bug-eyed kid with a large head and no neck (as seen on the cover of the book). The illustrations that are the true highlights in this book are the illustrations of the boy imagining that each of his body parts are falling apart, especially of the image where he thinks that his stuffing is coming out of him when he finds a piece of fuzz in his belly button. “Parts” is a brilliant children’s book about how young children explore their bodies and try to figure out what is happening to them as they get older and this book is great fun for the entire family to enjoy. I would recommend this book to children ages five and up since the vocabulary is simple enough, but I must warn about the gross content in this book for children who do not like gross material. I have a nephew with autism and he has a hard time comprehending sarcasm/popular sayings. This is a set of three books which uncover sayings such as "I'm cracking up, lend me a hand, cost an arm and a leg etc." Super fun to read as well! My listeners seemed captivated by the narrator's misunderstanding of natural bodily occurrences like hair caught in a comb, belly-button lint, sloughed-off skin, etc. The illustrations are especially notable for the protagonist's facial expressions, as he imagines the worst-case occurrence that he thinks is happening. Most especially, I thought that readers would relate to the narrator's concern and and eventual reassurance about a loose "baby-tooth." My younger listeners are at the age when some o My listeners seemed captivated by the narrator's misunderstanding of natural bodily occurrences like hair caught in a comb, belly-button lint, sloughed-off skin, etc. So cute! We have a little guy with anxiety too and we get how the little protagonist feels. This book (along with the others in this series) offers a ton of humor! Imagining body parts truly as parts and thinking that he is losing them, the narrator becomes afraid of leaving the house. My favorite is "I lifted up my shirt and found this little piece of fuzz. I stared at it, amazed, and wondered what this is all about? But then I understood. It was my stuffing coming out." The illustrations that accompany the text are hilarious as well. Definite read aloud for my story time group! This is a cute book. The illustrations are very pretty. At my pre-k placement is where I first saw this book. When we got to each body part I would stop and have the children point to it and we could talk about it. We could even do head shoulders knees and toes after we read the book. Reading this with Kindergarten, not sure how much they will understand but I hope it will lead to some good conversations about the "parts" of a book. more parts...cute kids book Aubrey let me borrow. Seems more adult almost because it's kind of how we think about things sometimes. We take things so literally and can start going crazy in our heads. Colette recommended this to me and it is a fun book. I like the illustrations and the humor. I let one of my students pick a book from the basket for us to read today, and this one was chosen. Having no idea what the book might be about, and curious about the unique title, I opened it up and began to read. We loved it! This is an adorable book about a very real issue for young children who are beginning to be curious about how the human body works. Our young protagonist seems to be falling apart. His hair is coming out. There's fuzz in his belly button. Skin is peeling off the bottom of I let one of my students pick a book from the basket for us to read today, and this one was chosen. Having no idea what the book might be about, and curious about the unique title, I opened it up and began to read. We loved it! This is an adorable book about a very real issue for young children who are beginning to be curious about how the human body works. Our young protagonist seems to be falling apart. His hair is coming out. There's fuzz in his belly button. Skin is peeling off the bottom of his foot, but the most dis consorting of all is when one of his teeth is suddenly loose. He is convinced that the glue that holds all his parts together is not working anymore, until his parents explain things to him. Parts is a great picture book for young children in either preschool or younger elementary school age children. This book is about a young boy who is exploring his body parts and how your body changes. He is almost in a panic thinking that the glue that holds us all together isn’t working for him. I thought this book was very cute and my kids really enjoy it so I gave this book a 5 star rating! Parts really teaches kids about their body and things like ear wax and teeth/hair falling out which ar Parts is a great picture book for young children in either preschool or younger elementary school age children. This book is about a young boy who is exploring his body parts and how your body changes. He is almost in a panic thinking that the glue that holds us all together isn’t working for him. I thought this book was very cute and my kids really enjoy it so I gave this book a 5 star rating! Parts really teaches kids about their body and things like ear wax and teeth/hair falling out which are things that most kids don’t think about and parents don’t always think to educate about until later. I really got a great laugh when he thinks that his brain is falling out because of a piece of fuzz that had came out of his nose and again when he wonders if he would fall apart if he sneezed or coughed? This book keeps children excited and, on their toes, when you are reading it to them. The illustrations also help keep them interested because of the different facial expressions the character in the book uses as well and the pictures of all his body parts “falling off”. This story is narrating about a kid found out some changes have taken place in his body, such as hair loss, tooth loss, desquamation, and runny nose. He was frustrated and worried that he would become fragile as a toy, the body will easily be separated. So he took a lot of tape to wrap himself up, then his parents told him that these were all normal. The illustrations are interesting and clear, the illustrator used a large illustration as the background for the child's imagination, and another illustration with the child looks worried at the bottom of the page. I would recommend this book to children, it may teach kids something that they are worried but afraid to ask their parents from their body. This book makes fun of small bodily changes that people experience, and blows it out of proportion. Young children will likely be able to relate to the narrator in the book, as they start to pay attention to parts of their bodies. The illustrations are very silly, and first show what actually happens and then shows what the narrator claims to be the reason for what is happening. The rhyming tone of the book makes the story even more playful and enjoyable. This fun non-fiction picture book is about parts on the body. It begins by first, his hair falling out then his skin started peeling from his toes. Then gross stuff started falling out of his nose. Things just kept happening to his body parts. I thought this book was very comical and I think kids would like it and laugh very hard. I would use this in my classroom by teaching them about the body parts and we would label parts of the body and then read this funny book. Cleanliness: uses the phrase "thank goodness." 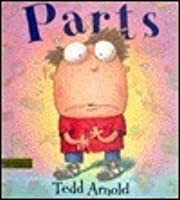 Parts by Tedd Arnold is a silly picture book about a boy who finds something wrong with a different part of his body everyday. One day something is coming out of his nose and the next day he notices a loose tooth. This fiction picture book a funny read for elementary readers and full of great illustrations. I would recommend this book for young readers as a simple humor read! Super cute book about a kid who sees things falling off of his body and misreads the situation. The illustrations are adorable and very entertaining. This book is best read by an adult to the child, since the book doesn't explain the reasons behind things, but it is an excellent starting point for parent/child discussions. Parts is a cute book that educated young children the different functions of the body. The book has the narrator discovering his bellybutton and thinks he is dying because there is lint in it. The narrator discovers his armpit and that there is hair growing there. This book guides and plays fun on children discovering their bodies as a casual and informative thing. This book is now one of my favorites. The pictures are so bright, which I love about children book and it relates to children and what their body goes through and how sarcastic they become when something different happens to them. The pictures were also silly. I definitely will be reading this to my kids in a year or so. What happens when an ordinary five year kid notices the subtle changes happening to his body? Skin peeling, hair falling out, belly button lint, and teeth falling out, could his whole body be falling apart, or coming unglued ? Find out what happens in this humorous tale of how the body works. This was a really funny story about changes. It was well illustrated and I liked that the author showed what was going on from the kids perspective. It is also a good story for discussing feeling with children. Silly book about a boy who thinks everyday something worse is happening with his body. There's fuzz in his belly button, his toes are peeling and something fell out of his nose. He believes he is coming unglued. This book is about a body growing up and thinks that he is falling apart. It ends up that he realizes that it's all part of growing up. I rate this book 5/5 because it gives kids a good idea of things that will happen to them as they grow up with all the honest things that come out. This book has a very uniquely funny way of describing the functions of our body parts. It's a great book to be read to children who are newly discovering all of their body parts. The language is easy to understand with colorful pictures that are suitable for a younger audience.